I am absolutely ecstatic, because I am finally kicking off the project I have been planning and working on since the last few months! In 2017, sustainable fashion got a lot of limelight in the industry, but I personally think that most people really didn’t understand the concept. I want to share my thoughts on the same, step by step, slowly with every single post of the series. This series, #MNSIndieProject , will focus on every Indian state’s indigenous fabrics, handicrafts and of course, style. Since most of us are happy shopping from fast fashion brands with stores popping up everywhere, I feel we are truly forgetting what our country has to offer. I am not against shopping from fast fashion brands, but I am not in favor of forgetting the awesomeness that our country has to offer! I will definitely explain more in the coming posts, but for now let’s start! I will try to cover as many states as possible and I would need all of your support to find out the gems of each Indian state! 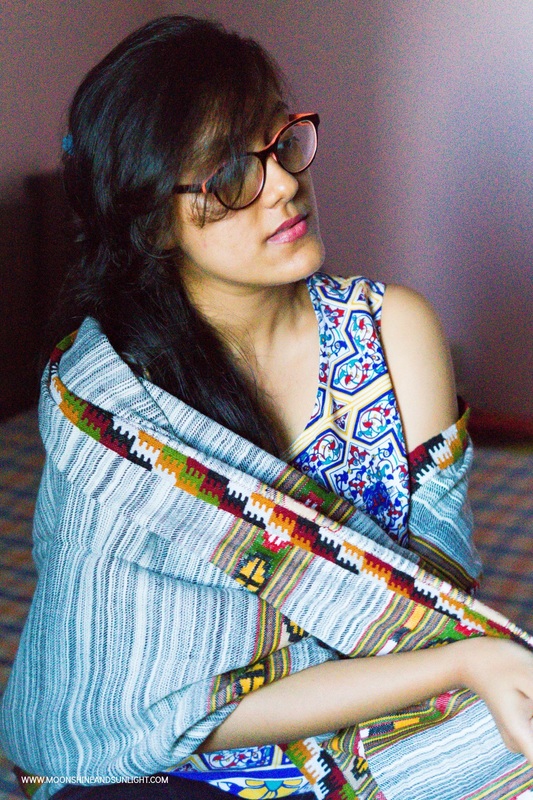 Starting off with a handicraft of Himachal Pradesh, Kulu Shawls! 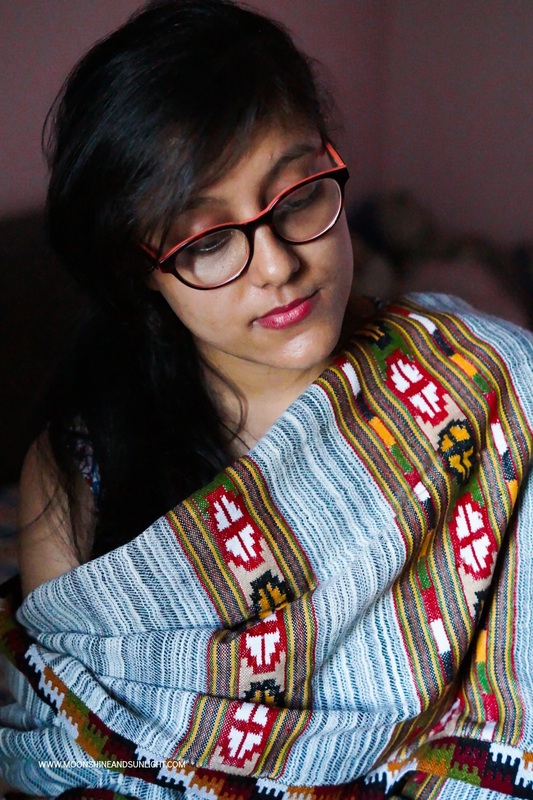 Last year, on my visit to Himachal Pradesh, I picked up this Kulu shawl, made of Yak’s wool! Needless to say I was in love with the beautiful state, but I couldn’t help but think what the people of the place use to keep themselves warm in the harsh winter! Found my answer, when I chanced upon a small shop with a woman on the handloom carefully weaving a shawl, in the basement. 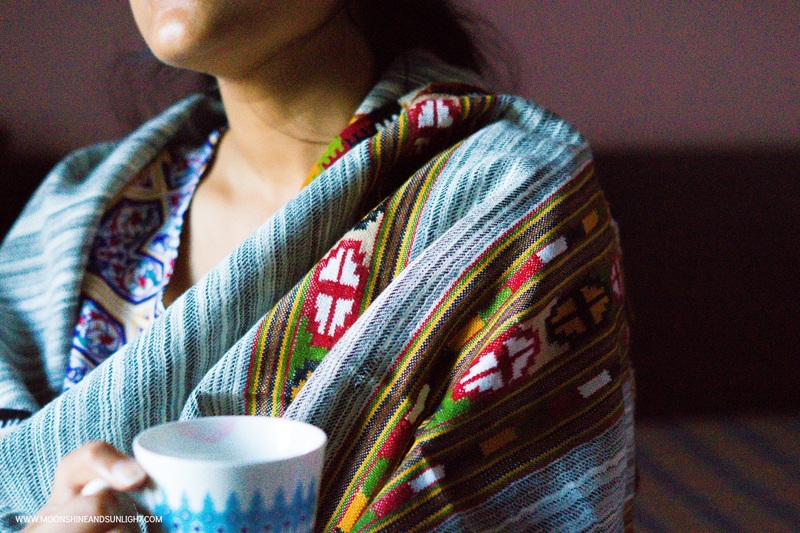 The beautiful geometric shapes in vibrant colors,is what gives the Kulu shawls the definition and distinctive touch. 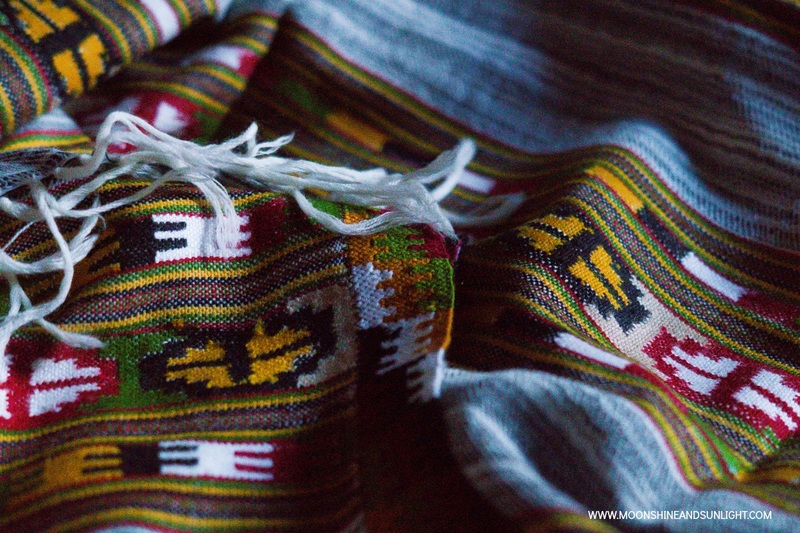 The shawls used to be plain, one colored; it was about 60-70 years back, when the patterns came into existence. These shawls are expensive, obviously because of the work that goes behind in making one. There are machine made shawls available as well, which are cheaper, but you can distinguish them from the handmade ones easily. 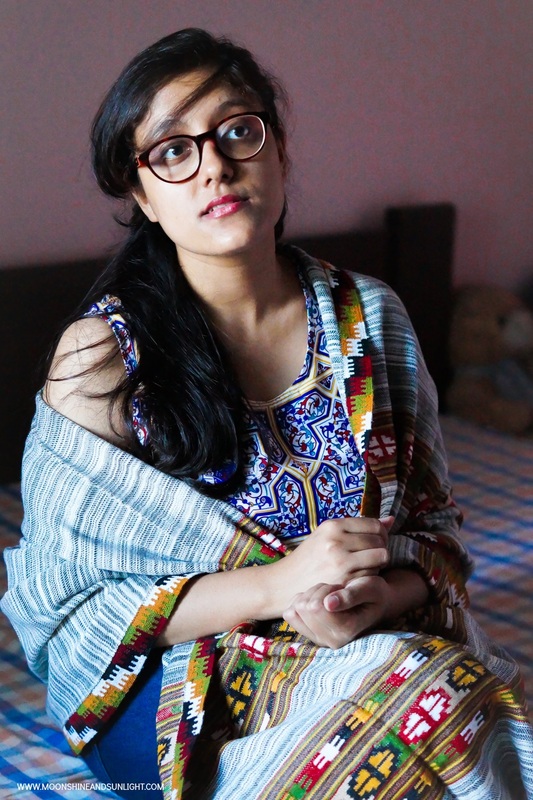 When it comes to dealing with the mild nip in the air, of the Bangalore climate, during this time of the year especially, I choose this versatile and unique shawl to complete my outfits. I absolutely adore how rich the colors look, on the grey body of the shawl. Many people think that wearing a shawl is old school, but wear it like a jacket with a belt to cinch it at the waist and voila! 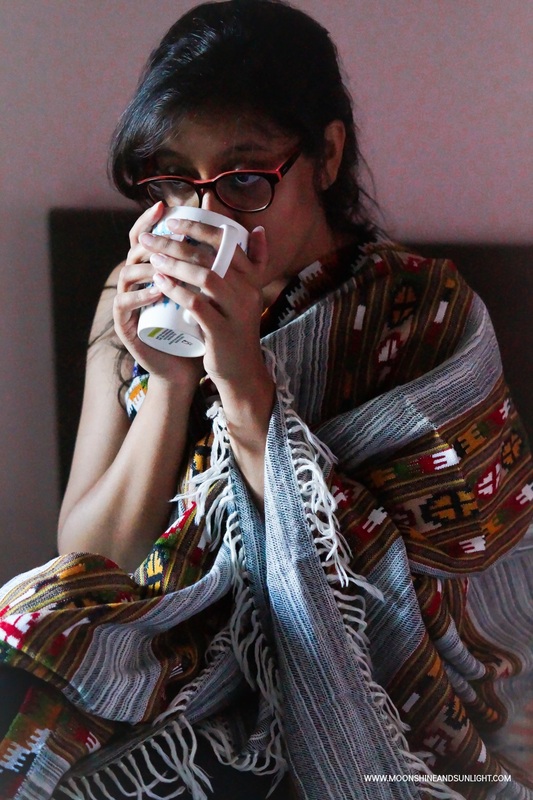 Or just wrap it around yourself, on a chilly afternoon, to accompany a glass of hot chocolate or badam(Almond) milk! I really hope you all will enjoy this series, as much as I am enjoying working on it. Do share your views in the comments. Please don’t forget to share this post with your friends! Also, if you post anything on social media, where you’re wearing something specific from an Indian state, please use the hashtag, #MNSIndieProject. Love the colors on the shawl! This is a great thought. Sustainable fashion needs more promotion.